“Slayers” is a fan favorite series that began in 1995, made up of three (now four/five) TV shows, a couple of OVAs, and several movies. It’s based on the short D&D children’s novels by Hajime Kanzaka. The TV show’s director, Takashi Watanabe, also directed the, “And now, for something completely different” OVAs, "Black Lion", and "Casshan: Robot Hunter". These are the light-hearted, whacked-out adventures of Lina Inverse, an easily angered, self conscious, traveling sorceress in search of treasure and… FOOD! 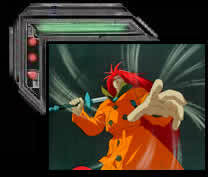 She’s sometimes aided, at other times annoyed, but most of the time befriended, by an odd-ball band of comrades: Gourry Gabriev, the skilled swordsman with the brains of a “jellyfish”; Amelia, the hero-inspired, justice-seeking princess who physically endangers herself by striking poses; Zelgadis, the chimera rock-man with an Eeyore-esc personality; and Xelloss, the mazoku/monster whose entire character is a “secret”; -- or, if you’re a “Slayers” movie and OVA fan, she’s mostly abetted by her self proclaimed “greatest rival”: the overbearing, scantily clad, perpetually dumbfounded sorceress, who can bring down an army with just the dangerous power of her laugh, Naga the White Serpent. Lina and crew take on a vast array of villains, ranging from a controlling mother, to the monstrous all-powerful demon god, Shabranigdo. A fun comedic series that really develops the relationship between the two leads, be it romantically between Gourry and Lina in the TV series, or buddy-buddy between Naga and Lina in the movies/OVAs. The show seldom faltered in delivering its tales of magic and adventure with fast-paced jokes and Punch & Judy gags throughout its 1990s run.